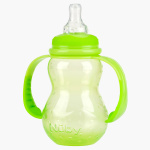 Nuby Feeding Bottle - 210 ml | Green | Anti-colic bottles to prevent baby from gas and colic. Now you can comfortably feed your baby and help prevent colic, thanks to this feeding bottle's variable flow design. Made from a BPA-free material with a special grip system, this anti-colic bottle is not only safe for your little one but also easy to use. Feature 2 : Variable flow. Feature 3 : Specially designed with non grip system.